Hello! Rachel here from Craving some Creativity and I am so excited to contribute my recipe for Asian Broccoli Slaw with Ginger Peanut Dressing today! The sweet tangy flavor of this dressing is made from a combination of soy sauce, peanut butter, and ginger. 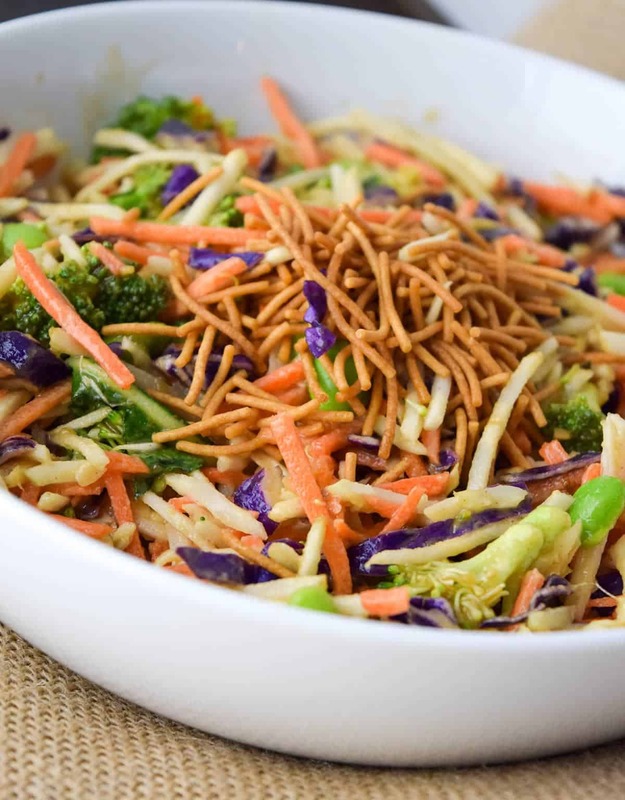 Normally, Asian slaw is made from traditional cabbage slaw mixtures. I sometimes add some napa cabbage into my recipe, but mostly I like to avoid slicing a ton of vegetables. I wanted something easy so this recipe uses a pre-mixture slaw. However, most store bought cabbage slaws are so boring! I love that the broccoli slaw has much more carrots, purple cabbage, and color. Mix in some edamame beans and it just needs the dressing. Even with snow still on the ground here, I am getting excited for spring to roll in with fresh vegetables, gardening, and a sense of life waking up after the winter slumber. I have been hard at work planning the new garden (last year was a disaster with the move). I’m thinking that I may try broccoli again this year, and then I could make this recipe from my garden. How cool would that be? In a small bowl, add honey, rice vinegar, soy sauce, penut butter, ginger, and garlic. Whisk together briskly until a uniform golden brown color. In a second large bowl, add slaw and edamame. Just before serving, toss dressing into slaw. Add rice noodles for garnish or on the side if desired. I’m so excited to try this recipe! My friend just got me into broccoli slaw/broccoli in general. Can you believe that a couple years ago I hated broccoli?? Now it’s my favorite vegetable to eat! Just one question for you: How many cups or packages of broccoli slaw went with this amount of dressing? I’m trying to see how many meals this will last me. I really appreciate your response and am looking forward to trying this and the other recipes on this site!